This article is about the Germanic chieftain. For other uses, see Arminius (disambiguation). Arminius (German: Hermann; 18/17 BC-AD 21) was a chieftain of the Germanic Cherusci tribe who commanded an alliance of Germanic tribes at the Battle of the Teutoburg Forest in 9 AD, in which three Roman legions were destroyed. 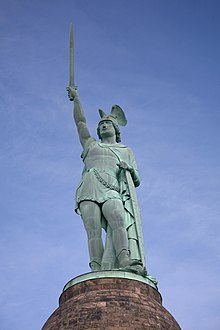 His victory at Teutoburg Forest would precipitate the Roman Empire's permanent strategic withdrawal from Magna Germania, and made a major contribution to the eventual fall of the Western Roman Empire. Modern historians have regarded Arminius' victory as Rome's greatest defeat. As it prevented the Romanization of the Germanic peoples, Arminius' victory has also been considered one of the most decisive battles in history, and a turning point in world history. Born a prince of the Cherusci tribe, Arminius was made a hostage of the Roman Empire as a child. Raised in Rome, he was drafted into the Roman military at an early age, during which he was granted Roman citizenship and became a Roman knight. After serving with distinction in the Great Illyrian Revolt, he was sent to Germania to aid the local governor Publius Quinctilius Varus in completing the Roman conquest of the Germanic tribes. While in this capacity, Arminius secretly prepared a Germanic revolt against Roman rule, which culminated in the ambush and destruction of three Roman legions in the Teutoburg Forest. In the aftermath of the Battle of the Teutoburg Forest, Arminius fought off retaliatory invasions by the Roman general Germanicus in the battles of Pontes Longi, Idistaviso and the Angrivarian Wall, and deposed a rival, the Marcomanni king Maroboduus. Germanic nobles, afraid of Arminius' growing power, assassinated him in 21 AD. He was remembered in Germanic legends for generations afterwards. Roman historian Tacitus designated Arminius as the liberator of the Germanic tribes and commended him for having fought the Roman Empire to a standstill at the peak of its power. During the unification of Germany in the 19th century, Arminius was hailed by German nationalists as a symbol of German unity and freedom. Following World War II, however, Arminius was omitted from German textbooks due to his association with militaristic nationalism, and many modern Germans are unaware of his story. The 2000th anniversary of his victory was lightly commemorated in Germany, which has replaced traditional nationalism with "an easy-going patriotism that mainly manifests itself at sporting events." No known portrait image of Arminius exists from life. This likeness was created by artist and historian George S. Stuart from physical descriptions mentioned in historical records. The etymology of the Latin name Arminius is unknown. Marcus Velleius Paterculus, in his Historiae, mentions him as "Arminius, the son of Sigimer, a prince of [the German] nation" and states he "attained the dignity of equestrian rank". Due to Roman naming conventions of the time, it is likely Arminius is an adopted name granted to him upon citizenship, or otherwise not his Cheruscan name. The origin of the use of the name Hermann dates from the 16th century, possibly first by Martin Luther. In German, Arminius is traditionally known as Hermann der Cherusker ("Hermann the Cheruscan") or Hermann der Cheruskerfürst ("Hermann the Cheruscan Prince"). Hermann etymologically means "Man of War", coming from the Old High German heri "war" and man "man". Arminius, born in 18 or 17 BC in Germania, was son of the Cheruscan chief Segimerus (German: Segimer; Proto-Germanic: Sigimariz; Old English: Sigemaer) and trained as a Roman military commander alongside his younger brother Flavus. He had lived in Rome as a hostage in his youth, where he had served in the Roman army between 1 and 6 AD, and had received a military education and obtained Roman citizenship as well as the status of equite before returning to Germania and driving the Romans out. Magna Germania in 9 AD. The yellow legend represents the areas controlled by the Roman Republic in 31 BC, the shades of green represent gradually conquered territories under the reign of Augustus, and pink areas on the map represent tributary tribes. Around the year AD 4, Arminius assumed command of a Cheruscan detachment of Roman auxiliary forces, probably while fighting in the Pannonian wars on the Balkan peninsula. He returned to northern Germania in AD 7 or 8, where the Roman Empire had established secure control of the territories just east of the Rhine, along the Lippe and Main rivers, and was now seeking to extend its hegemony eastward to the Weser and Elbe rivers, under Publius Quinctilius Varus, a high-ranking administrative official appointed by Augustus as governor. Arminius began plotting to unite various Germanic tribes to thwart Roman efforts to incorporate their lands into the empire. Between 6 and 9 AD, the Romans were forced to move eight of eleven legions present in Germania east of the Rhine river to crush a rebellion in the Balkans, leaving Varus with only three legions to face the Germans. An additional two legions, under the command of Lucius Nonius Asprenas, were stationed in Moguntiacum. This represented the perfect opportunity for Arminius to defeat Varus. In the autumn of AD 9, the 25-year-old Arminius brought to Varus a fake report of rebellion in northern Germany. He persuaded Varus to divert the three legions under his command (composed of the 17th, 18th and 19th legions, plus three cavalry detachments and six cohorts of auxiliaries) from the march to winter quarters to suppress the rebellion. Varus and his legions marched right into the trap that Arminius had set for them near Kalkriese, the Battle of the Teutoburg Forest. Arminius's tribe, the Cherusci, and their allies the Marsi, Chatti, Bructeri, Chauci, and Sicambri (five out of at least fifty Germanic tribes at the time) ambushed and annihilated Varus's entire army, totaling over 20,000 men. Recent archaeological finds show the long-debated location of the three-day battle was almost certainly near Kalkriese Hill, about 20 km north of Osnabrück. When defeat was certain, Varus committed suicide by falling on his sword. Arminius's success in destroying three entire legions and driving the Romans out of Germany was one of the most devastating defeats Rome suffered in its history, and a high point of Germanic power for centuries. Roman attempts to reconquer Germania failed although they managed to break Arminius's alliance. After the battle, the Germans quickly annihilated every trace of Roman presence east of the Rhine. Roman settlements such as the Waldgirmes Forum were abandoned. The vastly outnumbered Roman garrison of Aliso (modern day Haltern am See), under the command of the prefect Lucius Cedicius, inflicted heavy losses on the Germans before retreating into Gaul, resisting long enough for Lucius Nonius Asprenas to organize the Roman defense on the Rhine and Tiberius to arrive with a new army. This prevented Arminius from crossing the Rhine and invading Gaul. Between 14 and 16 AD, Germanicus launched punitive operations into Germany, fighting Arminius to a draw in the Battle at Pontes Longi and twice defeating him (according to Tacitus): first in the Battle of Idistaviso and later at the Battle of the Angrivarian Wall. Arminius also faced opposition from his father-in-law and other pro-Roman Germanic leaders. In AD 15, Roman troops managed to recapture one of the three legionary eagles lost in the Battle of the Teutoburg Forest. In AD 16, a second eagle was retrieved. Tiberius denied the request of Germanicus to launch an additional campaign for AD 17, however, having decided the frontier with Germania would stand at the Rhine river. Instead, he offered Germanicus the honor of a triumph for his two victories. The third Roman eagle was recovered in AD 41 by Publius Gabinius, under the emperor Claudius. With the end of the Roman threat, a war broke out between Arminius and Marbod, king of the Marcomanni. It ended with Marbod fleeing to Ravenna and Roman protection, but Arminius failed to break into the "natural fortification" of Bohemia, and the war ended in stalemate. In AD 19, Germanicus died in Antioch under circumstances which led many to believe he had been poisoned by his opponents. Arminius suffered death two years later, in AD 21, murdered by opponents within his own tribe who felt that he was becoming too powerful. Tiberius allegedly had refused an earlier offer from a Chatti nobleman to poison Arminius: "It was not by secret treachery but openly and by arms that the people of Rome avenged themselves on their enemies." Roman attempts to reconquer Germany failed although the Romans inflicted several defeats on the Germans. Arminius's victory against the Roman legions in the Teutoburg Forest had a far-reaching effect on the subsequent history of both the ancient Germanic peoples and on the Roman Empire. The Romans were to make no more concerted attempts to conquer and permanently hold Germania beyond the river Rhine and the Agri Decumates. Modern historians have regarded Arminius's victory as "Rome's greatest defeat" and one of the most decisive battles in history. During the Unification of Germany in the 19th century, Arminius became hailed as a symbol of German unity and freedom. Arminius had married a princess named Thusnelda, whose name is preserved only by Strabo. She was captured by the Romans while pregnant, so her son Thumelicus grew up in Roman captivity. Tacitus informs he had an unusual story, which the historian promises to tell, but it has been lost to us. This Roman sculpture of a young man is sometimes identified as Arminius. Arminius, without doubt Germania's liberator, who challenged the Roman people not in its beginnings like other kings and leaders, but in the peak of its empire; in battles with changing success, undefeated in the war. Arminius was not the only reason for Rome's change of policy towards Germania. Politics also played a factor; emperors could rarely trust a large army to a potential rival, though Augustus had enough family members to wage his wars. Also, Augustus, in his 30-year reign, had annexed many territories still at the beginning of the process of Romanization. Tiberius, successor of Augustus, decided that Germania was a far less developed land, possessing few villages, with only a small food surplus, and therefore was not currently important to Rome. It would require a commitment too burdensome for the imperial finances and for excessive expenditure of military force for a new achievement. Modern scholars have pointed out that the Rhine was a more practical boundary for the Roman Empire than any other river in Germania. Armies on the Rhine could be supplied from the Mediterranean sea via the Rhône, Saône and Mosel, with a brief area of portage. Armies on the Elbe, however, would have to have been supplied by extensive overland routes or by ships travelling the hazardous Atlantic. Economically, the Rhine already had towns and sizable villages at the time of the Gallic conquest. The Rhine was significantly more accessible from Rome and better equipped to supply sizeable garrisons than the regions beyond. Rome would control Germania by appointing client kings, which was cheaper than military campaigns. Rome chose no longer to rule directly in Germania east of the Rhine and north of the Danube; Rome preferred to exert indirect influence through client kings, so Italicus, nephew of Arminius, was appointed king of the Cherusci; Vangio and Sido became vassal princes of the powerful Suebi, etc. If indirect methods proved insufficient to control the Germanic tribes beyond the Rhine, Roman Emperors would lead devastating punitive campaigns deep into Germania. One of them, led by the Roman emperor Maximinus Thrax, resulted in a Roman victory in AD 235 at the Battle at the Harzhorn Hill, which is located in the modern German state of Lower Saxony, east of the Weser river, between the towns of Kalefeld and Bad Gandersheim. In the early 19th century, attempts were made to show that the story of Arminius and his victory may have lived on in the Old Norse sagas, in the form of the dragon slayer Sigurd of the Völsunga saga and the Nibelungenlied. An Icelandic account states that Sigurd "slew the dragon" in the Gnitaheidr—today the suburb Knetterheide of the city of Bad Salzuflen, located at a strategic site on the Werre river which could very well have been the point of departure of Varus's legions on their way to their doom in the Teutoburg Forest. 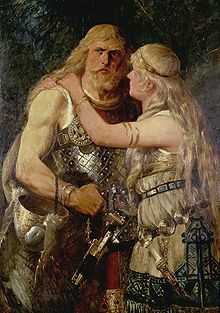 Also one of the foremost Scandinavian scholars of the 19th century, Guðbrandur Vigfússon, identifies Sigurd as Arminius. This educated guess was also picked up by Otto Höfler, who was a prominent National Socialist academic in World War II. In Germany, the name Arminius was interpreted as reflecting the name Hermann by Martin Luther, who saw Arminius as a symbol of the German people and their fight against Rome. Hermann der Cheruskerfürst became an emblem of the revival of German nationalism fueled by the Napoleonic Wars in the 19th century. In 1808, Heinrich von Kleist wrote the play Die Hermannsschlacht, but with Napoleon's victory at Wagram it remained in manuscript, being published in 1821 and not staged until 1860. The play has been revived repeatedly at moments propitious for raw expressions of National Romanticism and was especially popular during the Third Reich. In 1838, construction was started on a massive statue of Arminius, known as the Hermannsdenkmal, on a hill near Detmold in the Teutoburg Forest; it was finally completed and dedicated during the early years of the Second German Empire in the wake of the German victory over France in the Franco-Prussian War of 1870–1871. The monument has been a major tourist attraction ever since, as has The Hermann Heights Monument, a similar statue erected in New Ulm, Minnesota in the United States in 1897. The Hermann Heights monument was erected by the Sons of Hermann, a fraternal organization formed by German Americans in New York City in 1840 and named for Hermann the Cheruscan that during the 19th century flourished in American cities with large populations of German origin. Hermann, Missouri, a town on the Missouri River founded in the 1830s and incorporated in 1845, was also named for Arminius. Following World War II Arminius became a less known figure among West Germans and many schools shunned away from teaching the subject in any detail due to its previous association with nationalism. There was, however, a somewhat different perception in East Germany than West Germany. In East Germany, Arminius, based on a marxist reading of history, came to be seen as a revolutionary figure of sorts, leading German tribes in a fight against the Roman slaveholder society (Sklavenhaltergesellschaft). In the context of the cold war Arminius became a symbol for socialism, with Rome being a symbol for the capitalist United States as an oppressive empire. The 2,000 year anniversary of the battle in Germany was celebrated with restraint, avoiding "flag-waving festivals" and other gestures that might be interpreted as nationalism. According to Der Spiegel: "The old nationalism has been replaced by an easy-going patriotism that mainly manifests itself at sporting events like the soccer World Cup." The German Bundesliga football-club DSC Arminia Bielefeld is named after Arminius. The 2,000 year anniversary of the battle was also celebrated in New Ulm, Minnesota without restraint. There were mock battles between Romans and club weilding barbarians and also a lecture series in an auditorium. Arminio is a 1692 opera about Arminius by the Bohemian-Austrian composer Heinrich Ignaz Franz Biber. Arminio is a 1736 opera about Arminius by Handel. Arminius is an 1877 oratorio about Arminius by the German composer Max Bruch. Robert Graves' fictional autobiography, I, Claudius includes a description of Arminius's campaigns, where he is called "Hermann"; he is killed by members of his own family when he tries to "issue orders like a king". In the Czech novel Zlomený Meč (Broken sword) by Eduard Štorch published in 1932 Arminius challenges the Marcomanni king Marobodus for the leadership of the Germanic tribes. The novel mistakenly shows the Celtic tribesmen as being Slavs to support the rising Slavonic identification of the nationalistic Czechs. At the end of G. A. Henty's 1887 The Young Carthaginan about the Second Punic War, the main fictional character, Malchus, a cousin of Hannibal, decides to settle with the tribes north of the Alps and becomes an ancestor of Arminius. In the 2016 American docudrama Barbarians Rising, Arminius was played by Tom Hopper. ^ Dr. Aaron Ralby (2013). "The Roman Legion: Refining Military Organization". Atlas of Military History. Parragon. p. 241. ISBN 978-1-4723-0963-1. ^ a b "How the eagles were tamed". The Spectator. March 27, 2004. Retrieved January 16, 2015. 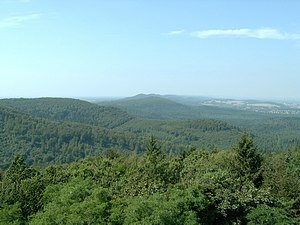 Mommsen referred to the Battle of the Teutoburg forest as a turning-point in world history. ^ a b Tacitus. The Annals.2.88. "Assuredly he was the deliverer of Germany, one too who had defied Rome, not in her early rise, as other kings and generals, but in the height of her empire's glory, had fought, indeed, indecisive battles, yet in war remained unconquered. He completed thirty-seven years of life, twelve years of power, and he is still a theme of song among barbarous nations, though to Greek historians, who admire only their own achievements, he is unknown, and to Romans not as famous as he should be, while we extol the past and are indifferent to our own times." ^ a b c d e f g Crossland, David (August 28, 2009). "Battle of the Teutoburg Forest: Germany Recalls Myth That Created the Nation". Spiegel Online International. Der Spiegel. Retrieved January 16, 2015. ^ C. Velleius Paterculus (1924). The Roman History. Loeb Classical Library. p. 118. ^ Herbert W. Benario (April 2004). "Arminius into Hermann: History into Legend". Greece and Rome. 51 (1): 83–94. doi:10.1093/gr/51.1.83. ^ Förstemann, Ernst Wilhelm (1900). Altdeutsches Namenbuch (in German). Nabu Press. ISBN 9781270714996. ^ "Arminius". Encyclopædia Britannica Ultimate Reference Suite. Chicago: Encyclopædia Britannica. 2014. ^ "Legio V Alaudae". www.livius.org. September 2010. ^ Winkler, Martin M. (2016). Arminius the Liberator: Myth and Ideology. Oxford University Press. p. 30. ISBN 9780190252915. ^ A. Giesebrecht (1837). "Ueber den Ursprung der Siegfriedsage". Germania (2). ^ unknown (1387). "Nikulas Bergsson, Arnamagnæan Collection manuscript 194, 8yo". ^ Simek, R. (1990). "Altnordische Kosmographie: Studien und Quellen zu Weltbild und Weltbeschreibung in Norwegen und in Island vom 12. bis zum 14. Jahrhundert". Berlin/New York. ^ G. Vigfusson, F. York Powell (1886). Grimm centenary; Sigfred-Arminivs, and other papers. Oxford Clarendon Press. ^ O. Höfler, "Siegfried Arminius und die Symbolik," Heidelberg (1961), 60–64, and also in Siegfried, Arminius und der Nibelungenhort (Vienna 1978); F.G. Gentry, W. McConnell, W. Wunderlich (eds. ), The Nibelungen Tradition. An Encyclopedia (New York–London 2002), article "Sigurd". ^ W. Bradford Smith (2004). "German Pagan Antiquity in Lutheran Historical Thought". The Journal of the Historical Society. 4 (3): 351–74. doi:10.1111/j.1529-921X.2004.00104.x. ^ Heinrich von Kleist: Die Herrmannsschlacht. Ein Drama  (Frankfurt am Main and Basel: Stroemfeld-Roter Stern, 2001). ^ Reeve, William C (2004). "Die Hermannsschlacht". The Literary Encyclopedia. The Literary Dictionary Company. Retrieved 2006-09-06. Cawthorne, Nigel (July 24, 2012). Battles That Changed History: An Encyclopedia of World Conflict. Arcturus Publishing. pp. 75–77. ISBN 1848589549. Davis, Paul K. (1999). 100 Decisive Battles: From Ancient Times to the Present. Oxford University Press. pp. 68–71. ISBN 0195143663. Durschmied, Erik (April 13, 2013). The Weather Factor: How Nature Has Changed History. Hachette UK. pp. 1751–70. ISBN 1444769650. Herfried Münkler / Hans Grünberger: Arminius/ Hermann als nationales Symbol im Diskurs der deutschen Humanisten 1500–1570, In: Herfried Münkler / Hans Grünberger / Kathrin Mayer, Nationenbildung. Die Nationalisierung Europas im Diskurs humanistischer Intellektueller. Italien und Deutschland (Berlin: Akademie, 1998), pp. 263–308. Murdoch, Adrian (1 December 2012). Rome's Greatest Defeat: Massacre in the Teutoburg Forest. The History Press. ISBN 0752494554. Tucker, Spencer (2010). Battles That Changed History: An Encyclopedia of World Conflict. ABC-CLIO. ISBN 1598844296. Wikimedia Commons has media related to Arminius. Wikisource has the text of the 1911 Encyclopædia Britannica article Arminius. This page was last edited on 13 April 2019, at 19:07 (UTC).